Creinse Limited, a leading brand innovation, music and entertainment company in Bangladesh, today announced that it has secured a brand license and program license agreement with Viacom International Media Networks (VIMN) Asia, a division of Viacom Inc., a leading provider of ‘glocal’ entertainment content, to initiate MTV program syndication in Bangladesh. Under this agreement, Creinse Limited will market and produce MTV program content and localized MTV formats for the Bangladesh market. Dhaka, May 20, 2013 – Creinse Limited, a leading brand innovation, music and entertainment company in Bangladesh, today announced that it has secured a brand license and program license agreement with Viacom International Media Networks (VIMN) Asia, a division of Viacom Inc., a leading provider of ‘glocal’ entertainment content, to initiate MTV program syndication in Bangladesh. Under this agreement, Creinse Limited will market and produce MTV program content and localized MTV formats for the Bangladesh market. Through this collaboration, Creinse will represent the MTV Hits, a non-stop international branded block and produce local MTV-branded versions of MTV Chart Attack and My Celeb MTV in Bengali –both highly successful and well-received formats under the global youth entertainment brand – with potential of future expansion of the agreement in the future. Creinse will look to secure placement of the MTV Hits branded block, produce the local formats and secure syndication of the formats. A VJ search will be initiated shortly to select the first ever VJs for the initial MTV program formats in Bangladesh. “There is no doubt that MTV continues to be the cultural home of the millennial generation across Asia, as we promote and reflect local and cultural tastes and music talents across the region. We picked Bangladesh to be our next stop in our on-going plans to expand our regional presence as it is a vibrant market with great potential and an exciting emerging local music scene and we are confident this MTV content will connect with local audiences. Furthermore, Creinse will bring to life our brand experience and connection with the Bangladesh music, operators and advertisers with the locally produced MTV formats,” said VIMN Asia’s executive vice president and managing director, Indra Suharjono. 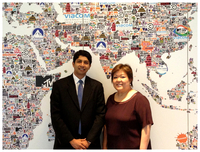 “The collaboration with MTV Asia is a game-changer for the music industry in Bangladesh. We anticipate this will not only create a new standard for local productions, but Creinse will now be an enabler between local music talents and a global brand like MTV! We are excited to help bring the local music entertainment scene to the next level,” said Rabeth Khan, Managing Director, Creinse Limited. Of the programs, MTV Hits will bring fresh, original, happening music from around the world to the homes of every music enthusiast in Bangladesh. My Celeb MTV will be produced locally, featuring the local music stars and upcoming music talents, while MTV Chart Attack will be the biggest music charts of the country featuring local music hits and videos. In addition to the MTV program formats, opportunities for viewers and music talents will be created through contests and competition platforms through which they may win opportunities to participate in regional MTV music events. Creinse Limited is an out of the box innovation driven company aspiring to work in the areas of consumer engagements, music, sports, lifestyle, social business, CSR, live event, television content and innovation. Since its inception in 2012, Creinse has hosted the live event performances of world’s leading music bands MLTR and Grammy Nominee Reggae Performer Julian Marley in Dhaka. In addition, Creinse also staged a music talent hunt, “Sing with MLTR” in which the winner went on to sing with MLTR and becoming the first ever artist from Bangladesh to perform with an internationally acclaimed music band/performer. In the area of sports, Creinse is working in couple of grass root cricket development projects in Bangladesh in association with international organizations such as London Tigers and Kids Cricket World UK.